What to do when you don't have props? Hey yogis, as you most likely know by now, I LOVE yin yoga! If you subscribe to my channel, odds are you do too. 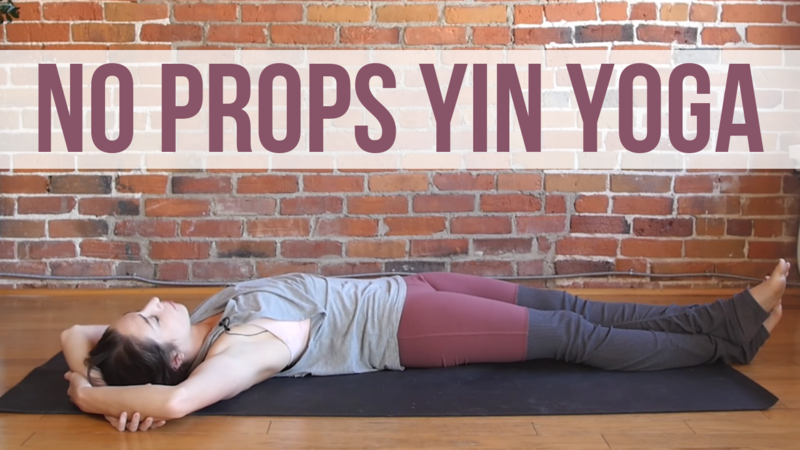 I'm sure you've noticed that yin is a pretty "prop intensive" practice which isn't always super convenient. You guys asked for more Yin Yoga classes without props and I'm here to deliver! This week's new YouTube yoga class is a 40 minute yin practice you can do with just you and your mat :) Enjoy! Since we're on the topic of Yin Yoga, I wanted to talk about TEACHING this style. Personally, it’s one my FAVORITE yoga styles to teach and practice because of its healing powers for the mind, body, and soul. If it's a style you feel inclined to teach, I can help! With my new online Yin Yoga Teacher Training, you’ll gain the skills and knowledge to effectively guide your students through these poses. But, it’s not JUST for yoga teachers! Each lesson is designed to deepen your appreciation for the Yin philosophy and take you to the next level in your OWN practice. This program is truly life-changing. I poured my heart and soul into it.. This is everything I wish I had known when I first started offering yin yoga classes. Don’t just take my word for it… Here’s a testimonial from one of my students! Sign up for my online Yin Yoga Teacher Training today!